Domino toppling can be performed with just about any type of dominoes, including standard sets. However experts such as Weijers Domino Productions, the current team record holders, use special dominoes made of recyclable polystyrene. For large-scale projects, the uniformity of the dominoes is important. 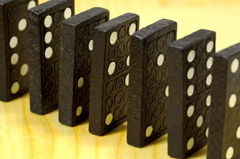 What’s more, different types and sizes of dominoes will topple at different speeds. Many toppling projects also use different non-domino elements such as ramps and marbles. These elements spice up the project with added complexity. Draw out your toppling plan beforehand. You can also sketch lines on the floor or tabletop to aid in the setup. This is especially helpful for keeping lines straight and curves uniform. Though you can place dominoes by hand, you may sometimes find it useful to use tweezers. When building a large project, use safeties. Safeties are breaks or barriers that you put in place between sections to protect most of your work if the dominoes fall prematurely. One type of safety is a wooden barrier. Another type of safety is a break — in other words, simply leave out a few dominoes to create a gap. Remove the safeties at the very end of the build. The “Fan Area” at Weijers Domino Productions website has good information for anyone interested in being a domino builder and toppler. At least one book about domino toppling is available at Amazon. It’s called Championship Domino Toppling by Robert Speca. The single-person record for most dominoes toppled is 303,621 set by Ma Li Hua of China on 16 Aug 2003 in Singapore. The team record is 4,345,027 set by Weijers Domino Productions on 14 Nov 2008 in Leeuwarden, Netherlands. Setting this record required a professional team of 15 designers and engineers who worked for 8 months, plus 90 builders, managed by a professional team of 25, who worked for 2 months.